Scientists in the Brandizzi lab are increasing our understanding of expand iconendocytosis, how plant cells import molecules from their surroundings. During endocytosis, the cell identifies an external molecule. The cell's outer cover, the plasma membrane, folds inwards, luring in that molecule. The folded part then pinches off and takes the surrounding cargo to its destination inside the cell. Endocytosis is essential for plant health. It is how cells fine-tune the amounts of molecules they import. Otherwise, plants can get damaged. For example, experiments where the process is faulty leads to smaller roots and shoots. "We do not still fully know how this process works. We want to understand how it talks with other parts of the cell and hands them the imported molecules," says Giovanni Stefano. Stefano is a Research Assistant Professor in the lab of Federica Brandizzi. Now, Stefano and a team of scientists reveal one way how the expand iconendoplasmic reticulum (ER), the plant's protein factory, is connected to the process. The study is in the journal Cell Reports. The scientists focused on two proteins, called VAP27-1 and VAP27-3. Both are found at the contact sites between the ER and the plasma membrane. "It seems that these two proteins bridge the ER with the endocytic membranes through an interaction that involves lipids," Stefano says. "We are the first to show, through various analyses and microscopic imaging, how these proteins impact endocytosis." The VAP proteins work like hotspots that tell the cell where endocytosis should take place. 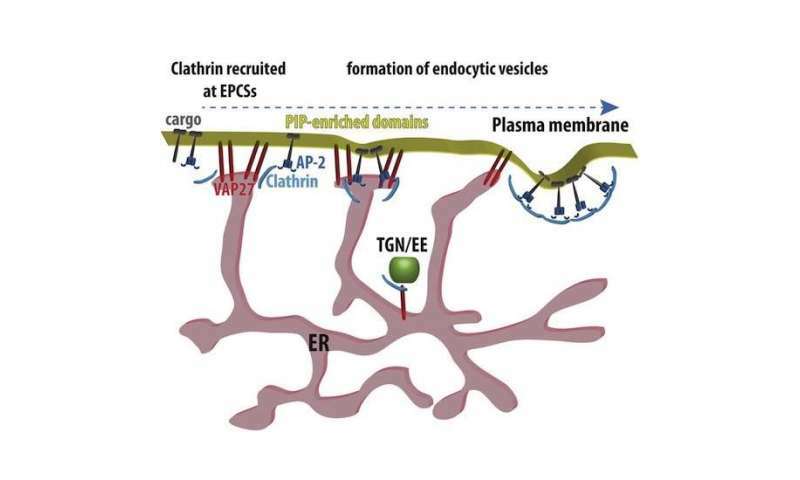 They do it by recruiting a component, known as clathrin, which triggers endocytosis. And the VAP proteins seem to be a crucial part of the process. "When we remove them from a plant, endocytosis and growth rates become unbalanced," Stefano says. "But endocytosis is only partially compromised. We are not sure yet if there are other components that explain why it still works to a certain degree." The two VAP proteins in the study belong to a larger collection of four proteins, all called VAP. "All four proteins are found at the contact site between the ER and the plasma membrane," Stefano says. "We think they play overlapping roles in endocytosis. Each one might target a different plant tissue."